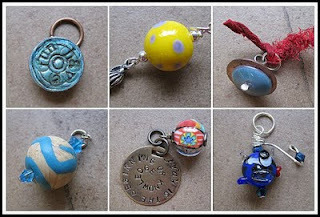 Today is the reveal day for the Charm Swap with a Twist hosted by Jennifer Cameron of Glass Addictions. This twist is that 2 sets of charms will be auctioned on ebay (set one here and set two here) for Beads of Courage. I was thrilled to participate in this swap with these amazing bead artists. In fact, when I opened the swap package I immediately felt like I was in a little bit over my head. Jonathan (my 20 year old son) was with me and was amazed, too. He said, "Mom, you really should start working with glass. Those beads are amazing." As you can see, he was right. As for my inspiration, whimsy was my inspiration and that's exactly what I call the beads that I used to create my charms. Whimsy. I coupled my polymer bead with a little glass star and a crystal to match. A little wrap and voila. Please head over to the other artists blogs to see more of these lovely charms. And, if you'd like a set of your own, they can be yours while contributing to an amazing cause. Get to clicking. Sandi, those really are beautiful charms! I truly enjoyed this exchange! Sandi~your charm turned out so lovely. I really thought it was wood! Just goes to show what an amazing material polymer is. As a glass addict, I totally think you should start making glass beads ;o) the more the merrier! Thanks for playing along, it was so fun getting your bead. I did think it was wood, too, at first - you did a great job with the clay! Thanks so much for your charm and for playing along! Sandi~ I can't believe that the charm I received is polymer clay and not wood! I kept look at it knowing that it must be polymer clay but amazed at how it really looked like wood! You really nailed it! Thank you for the fabulous charm!